That’s about to change. In a gargantuan effort Adriana Dutkiewicz and her colleagues carefully analysed and categorised 15,000 seafloor sediment samples to reveal the nature of sedimentary blankets over ocean ridges, seamounts and the vast abyssal plains. She teamed up with big data experts to find the best way to use modern computer algorithms to turn the vast sea of point observations into a continuous digital map. 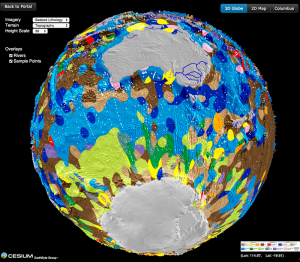 The first “census of seafloor sediments” reported in the journal Geology is rendered as a spectacular, interactive spinning virtual globe that allows anyone to fly through the colourful patchwork of seafloor geology draped over a terrain map. Why is this important? The deep ocean floor is a graveyard with much of it made up of microscopic sea creatures called phytoplankton, whose dead remains rain down through the water column like “marine snow”. The composition of their shells is used to decipher how our oceans have responded to past climate change. Tiny organisms called diatoms, thriving in sunlit surface waters, produce about a quarter of the oxygen we breathe, and they make a bigger contribution to fighting global warming than most plants on land. Their dead remains sink to the bottom of the ocean, locking away their carbon. Surprisingly, the new seafloor geology map demonstrates that diatom accumulations on the seafloor are nearly entirely decoupled from diatom productivity maxima in surface waters in the Southern Ocean. Independently, a similar decoupling was recently reported for the Northeast Pacific, supporting these results.